Our readers are an insatiably curious bunch, especially when it comes to information about their homes. Based on some recent inquiring e-mails, and the steady popularity of the topic on our Chatterbox Lounge forum, I thought a brief introduction to researching one's home might be in order. 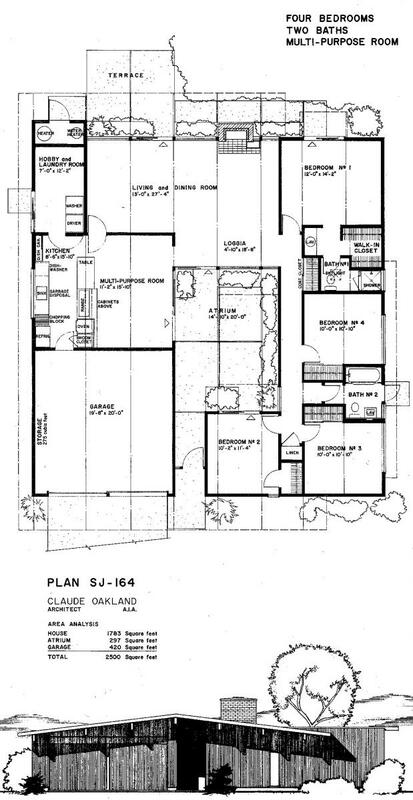 Eichler owners often need a set of original plans in order to carry out repairs (especially on the radiant heat system) or remodels. While we can't prescribe a universal solution on how to find those plans, or how to acquire a history of your house, we can offer a few useful tips on how to conduct the research. The basic information most people need, to start with, includes the year your home was built, the architect who built it, and, if it's part of a development, the model number. That information will make it a lot easier to find the plans at an archive or city agency. Luckily for Eichler owners, archives at UCLA and UC Berkeley hold collections from Jones & Emmons and Claude Oakland, respectively. More on that later. First, let's cover the basics. The power of search: Figuring out what year your house was built should be easy. If you're just moving in, the realtor should be able to tell you. But a simple Google search for your address will probably turn it up through a site like Redfin, Trulia, or Zillow. Once you have the date, you can start to narrow down who the architect was. Between 1952 and 1960, Joe Eichler used only two architectural firms: Anshen and Allen and Jones & Emmons. After 1960 it was Oakland and Jones & Emmons. By the time you get beyond 1966, our publisher Marty Arbunich says, it's almost all Oakland. As a side note, Oakland worked on staff at Anshen and Allen during the ‘50s, so many of the designs credited to that firm were actually his. Ask around: Many realtors can't wait to boast about the home's pedigree, so again, if you're a new buyer, ask for the architect's name and the model number. If possible, get the realtor to help you find the plans at the time of purchase. If the realtor doesn't know, or you've already stopped working with them, start talking to the neighbors. Many Eichler developments still include at least one or two original owners, or failing that there will almost certainly be someone who bought from an original owner. If anybody has an original brochure, or a copy of one, that can be very useful to finding both the architect and the model number via printed floor plans. 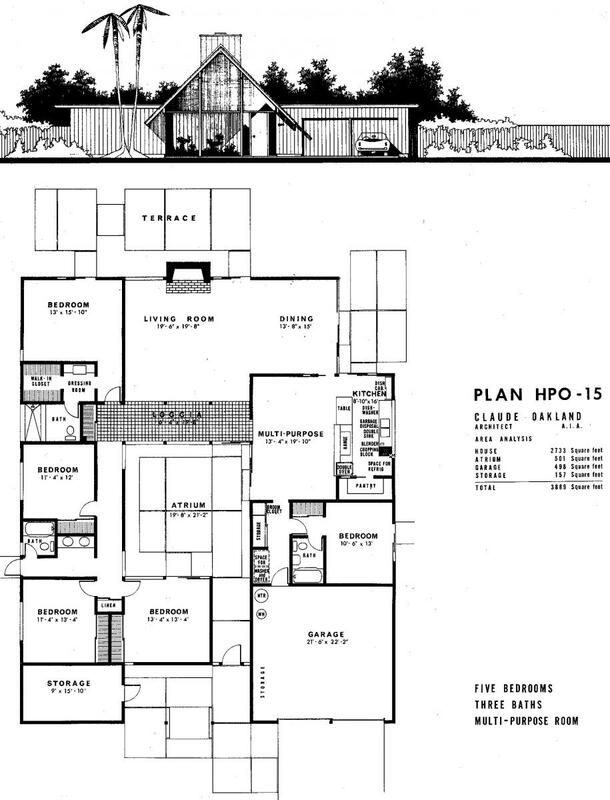 Use the floor plan: Make a sketch of your home's floor plan to use as a research tool. This will come in handy if you can acquire some of those original brochures or presentation drawings. If you simply can't find the model number, you might be able to use your sketch as a comparison while leafing through plans in one of the archives. Use Public Records: Depending on which city and county you're in, there will be some kind of record of your home's construction and sale, and the city may even have plans and names of architects on file. Those who live in custom homes, as opposed to tract homes, are especially likely to find that their city's building department possesses plans. At the very least, the county assessor's office will be able to give you the basic real property data, including dates and amounts of sale. Start with inquiries at the city building department and the county assessor's office, be polite, have as much information ready as possible, and, if they can't help you, ask who can. Plumb the archives: Many Eichler owners will find their home's plans sitting in an archive either at UCLA or UC Berkeley. The UCLA library holds the Jones plans in its Special Collections department, where the staff is happy to help homeowners try to track them down if you call and ask. A model number will help you here, but if you don't have it, you may be able to find it using the archive along with your floor plan sketch or maybe a tract site plan. Similarly, the Environmental Design Archive at UC Berkley holds the Oakland papers, though they haven't yet been filed (the archive is actually raising money to try to do that now). Again, start with a phone call or email to find out how to go about obtaining plans using the information at your disposal. Both of these archives will provide copies of the plans for a modest reproduction fee. Sadly, we know of no comprehensive repository of Anshen and Allen plans. The firm, now called Stantec, did not reply to my inquiry about what plans, if any, may be available to homeowners. Update: There's hope yet, Anshen and Allen dwellers. After this item published, I got an email from Scott Coates, a principal at San Francisco architecture firm Meeks, Coates & Eaton, who wrote to say he had a collection of surviving Anshen and Allen plans. Email scott@mcearch.com. Ask the Experts: If you find yourself frustrated by your own research efforts, the Eichler Network will try to help you find basic information, using our own collection of original brochures. We have no actual plans, but we might be able to help find your architect or model number. Send an email to info@eichlernetwork.com, and include as much information as you've been able to obtain covering the points we mentioned above: year of construction, development name and location, and a sketch of the floor plan. If you know the architect and / or model number, your best bet is to start with one of the resources listed above (ie. university archives, city building departments, or Scott Coates).